Last week, Shake and I were invited to join the Mālama Maui press trip, hosted by the Maui Visitors Bureau and partners, to experience the Ritz-Carlton Celebration of the Arts weekend, and then go down to Hāna, where we stayed at the Travaasa Hāna property and got to do Hāna things without the hassle of a two-hour drive down the windy road. I’ll post later about Celebration and about all the crazy-amazing things we ate on the trip, as well as the hike we did that (hopefully) burned off everything I stuffed in my stomach. Farm Day is a celebration of our family farmers and food producers, including their dedication to providing us with the highest quality of fresh and seasonal foods. 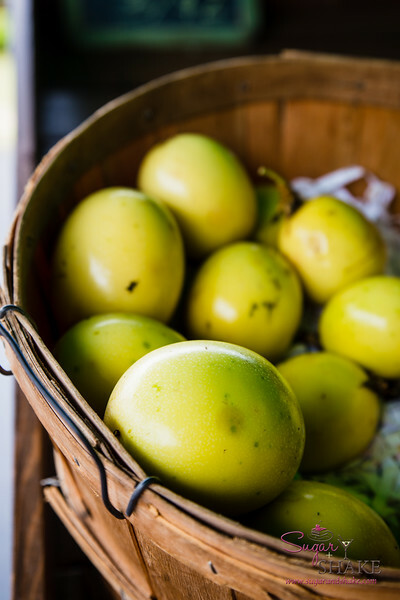 1) Pick up the Spring issue of edible Hawaiian Islands magazine or download the edible Hawaiian Islands Farm Guide for a wide selection of agricultural producers from across the islands. 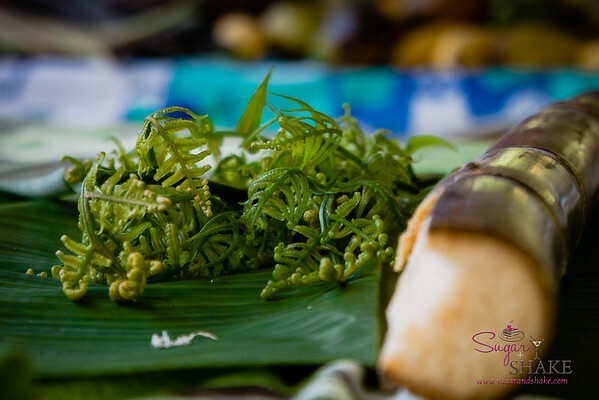 (The guide contains farmers, ranchers, food producers and supporters conveniently divided by island. Before you visit, it’s best to confirm info as offerings are subject to change). 2) SHOP at a farmers’ market, VISIT a farm, TAKE a farm tour or WORK on a farm on May 23, 2015. 3) Share your experiences on Facebook, Instagram and/or Twitter using the hashtag #EHIFarmDay15. We’ll be tracking you the whole way through for great photos and stories! Personally, I’m planning on stopping by the Kaka‘ako Farmers Market (at Ward Center) to pick up some Link Honolulu sausages and bacon. What? The oinkers are raised on a farm! OK, we should probably get some veg, too. I love visiting farms. My passion for it started (work-related shill alert) when I worked on The Hawai‘i Farmers Market Cookbook, Vol. 2 and as part of the press campaign, organized several morning TV shoots at local farms. We visited several, including—my favorite of the bunch—Twin Bridge Farms where I learned exactly how asparagus grows. It’s tall and leafy; it looks a lot like a field of ferns. Totally not what I thought it would be. OK, actually, I didn’t really think about it. But this was surprising. Yes, that fluffy field is asparagus. It looks a lot like dill or fennel. In addition to Twin Bridge Farms, I got to visit Ho Farms (they grow my favorite tiny tomatoes), Naked Cow Dairy (they make some awesome cheese! 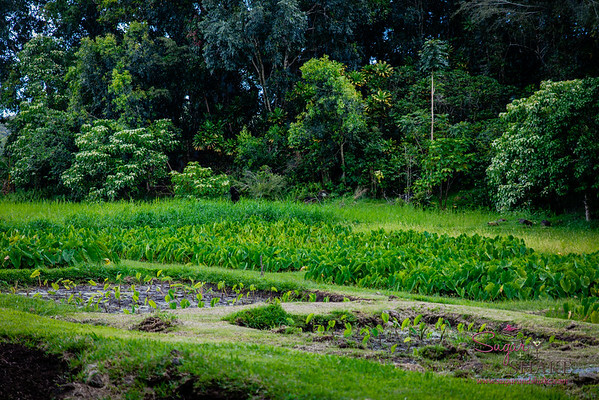 ), Sumida Farm (they’re the ones growing the watercress along the highway by Pearlridge Mall) and Kahumana Farm (out in Wai‘anae, they also grow their community by offering programs to help the homeless and developmentally disabled, in conjunction with their farming). I have a particular fondness for this book project because this is when I really started to learn more about where food comes from and the people who grow it and cook it for us. I owe a great deal of Sugar + Shake’s inspiration and existence to the experiences that came out of this book. My most recent farm visit—until last week—was a couple years ago when we took a field trip to Ho‘opono Farm on Maui after an invite from Chef Wes Holder (then of Pulehu at the Westin, now at Roy’s Kā‘anapali). We went to check out the peas being grown just for his AgFest competition dish, Risi Bisi (English Pea Risotto). 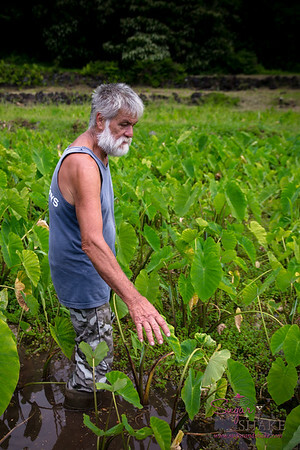 Kapahu Living Farm in Kīpahulu, past Hāna and actually located in the Haleakala National Park is a unique farm experience. 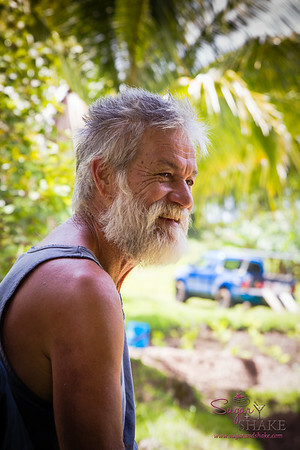 Uncle John and Aunty Tweety Lind run the farm and grow mostly taro, but also other fruits and vegetables, like mango, papaya, banana, sugarcane, tomatoes and pohole (fiddlehead fern). 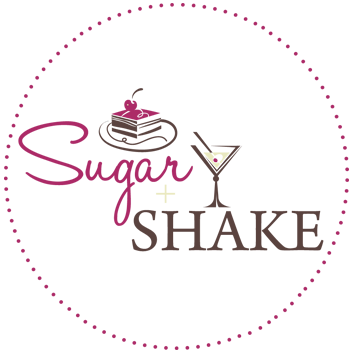 The operation is a 501(c)(3) nonprofit with special permission from the Park Service to operate within the Park boundaries. 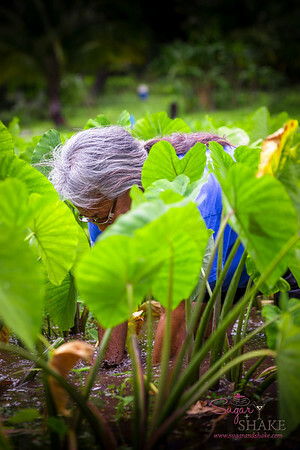 It’s called a “living farm” because it is an educational experience where visitors learn about the Native Hawaiian culture and how they farm. 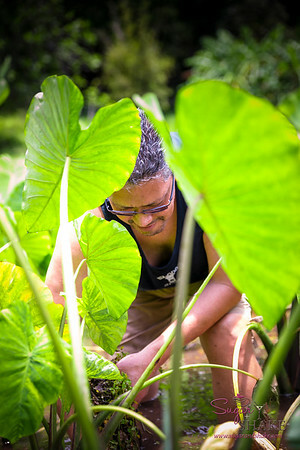 You can even get dirty and learn how to work the lo‘i (taro patch). We were greeted with the bounty of Kapahu and sat down to talk story with Uncle John (right) and Aunty Tweety. After that, we went down to the lo‘i to see how it’s done. Uncle John and Aunty Tweety gently stepped in (you really have to be careful—the water is shallow, but it’s impossible to tell how deep the mud is so you can actually sink in up to your hips in some spots) and demonstrated how to gather up all the weeds (anything sticking up that’s not taro), bundle them together and then slowly push the bundle into the mud and bury it. Uncle John said that the heat of the decomposition gets so hot, sometimes when you stir up the mud, you’ll see charred fragments of leaves and sticks float up. We ended up being extremely grateful for this nourishment since we headed out on our hike right after—two miles into the valley, though an exquisite bamboo forest, to Waimoku Falls…and two miles to hike out again. I’ll tell you more later. On our final morning in Hāna, Shake and I stopped at the Hāna Fresh Farm Stand on our way out. 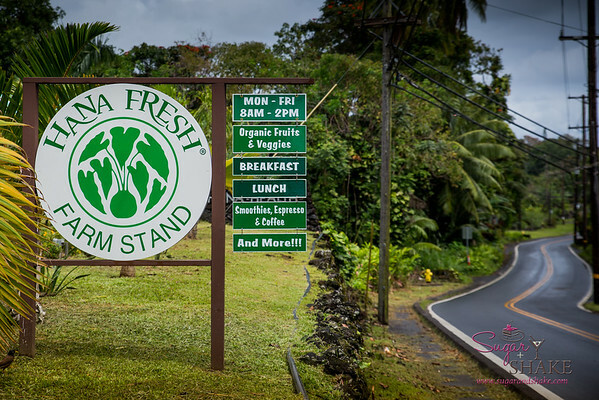 The Farm Stand is part of the Hāna Health program, offering medical services to the community, and they sell fresh produce and tasty, healthy food. We’d just eaten breakfast at Travaasa, so we were too full to try the panini, which was a shame—they looked amazing. 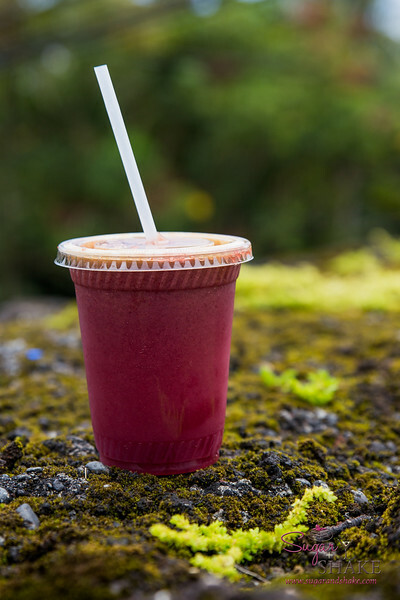 I opted for a fresh juice instead and got the “Forever Young,” a mix of apple, beet, ginger and pomegranate juices, plus blueberries, cinnamon and cayenne pepper. We all know how anti-beet I am, so I requested my juice sans-evil beets. I did try to (wo)man up and didn’t ask them to take out the pepper. It may have been a too-bold move for me. 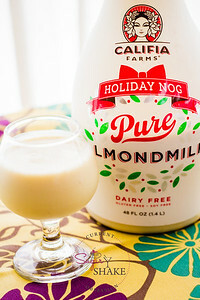 It certainly made me feel energized, and probably did good things for me, but I couldn’t do more than take tiny sips. Oh well. It kept me from drinking the whole cup before we even got a mile out of Hāna. 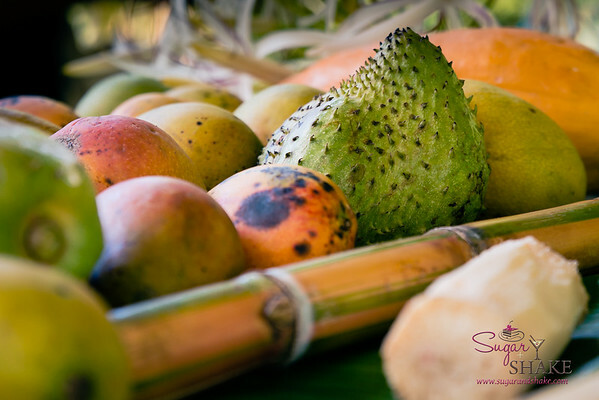 When you see the incredible variety produced by Hawai‘i farms, you can only feel very fortunate. 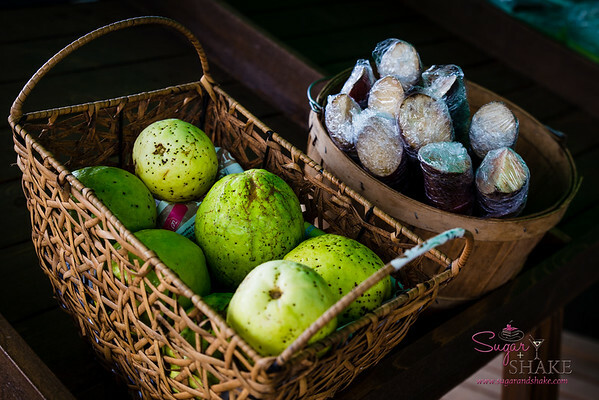 We have fruits and vegetables in abundance; beef, pork and chicken; and even luxurious chocolate and coffee. I hope you’ll take up the #eHIFarmDay15 challenge and meet a farmer or make it a point to buy local this weekend. And not only that, make a commitment to bringing more of what we grow here into your home. We spend a bit more on groceries now, but I wouldn’t change it—we think our food tastes better and the appreciation we have for those who grow it makes eating a greater pleasure. Disclosure: We were invited to attend the Mālama Maui press trip as guests of the Ritz-Carlton Kapalua, Travaasa Hāna and the Maui Visitors Bureau. 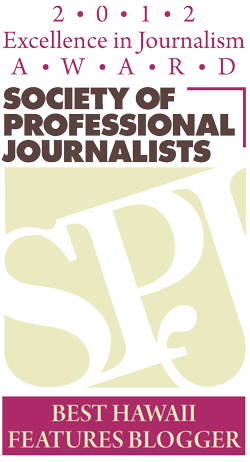 Travel and accommodations were provided by the hosts, but no financial compensation was received for this post and no representative from the establishment/event was given the opportunity to review or comment upon this post prior to publication. Friday Photo — Bamboo, Serene and Strong Maui Field Trip: Ho‘opono Farm Field Trip: Manulele Distillers (Kō Hana Rum) Hello, Hāna! Thanks, Dania! 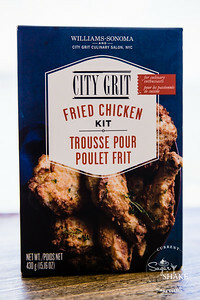 Wait ‘til you see the food recap! Chef Conrad served us dinners more than 90% local-sourced, and they were AMAZING! And it’s so beautiful & peaceful in Hana…I hope to go back to stay again soon! Love Hāna. I worked at the health center in Hāna for two anc a half years. Hāna Fresh is such a great addition to the community. 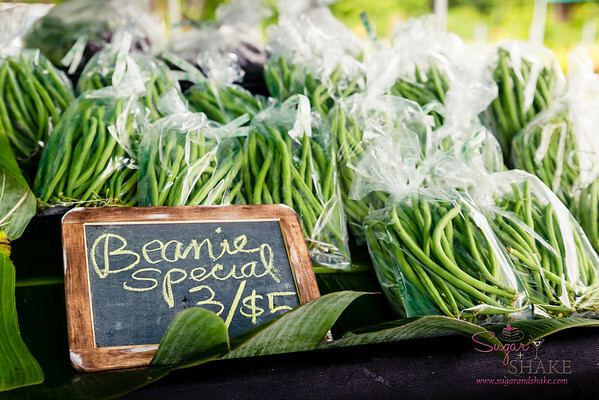 Ten acres, growing food, farm stand open 7 days. 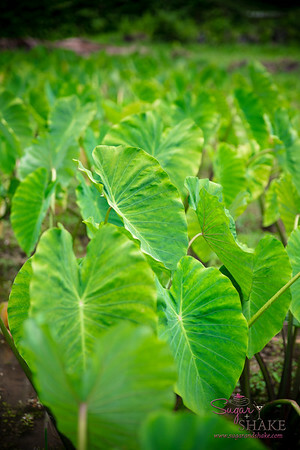 I would love to jump in the loʻi with the taro plants. This was the first time I’ve stayed more than an afternoon, and I LOVED it! If we were going to stay the whole afternoon to help in the lo’i, I would totally do it. ‘Cause that would make getting muddy worth it!